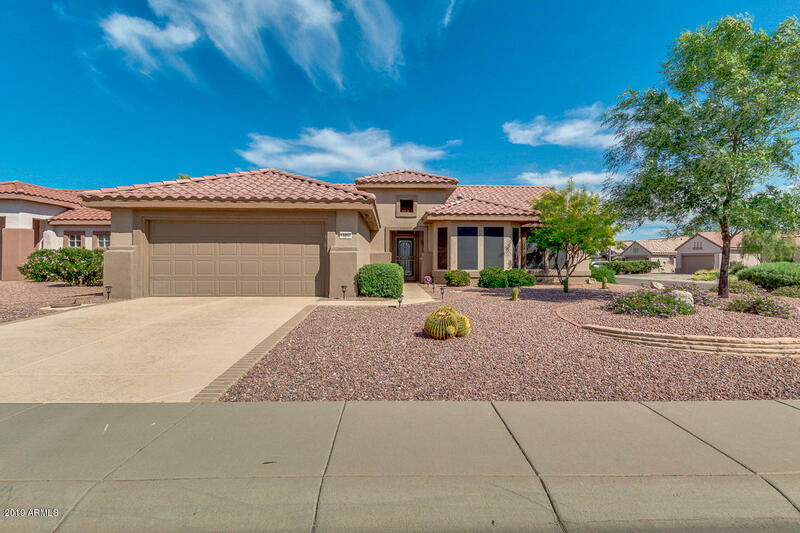 All SUN CITY GRAND-DESERT BRE homes currently listed for sale in Surprise as of 04/23/2019 are shown below. You can change the search criteria at any time by pressing the 'Change Search' button below. 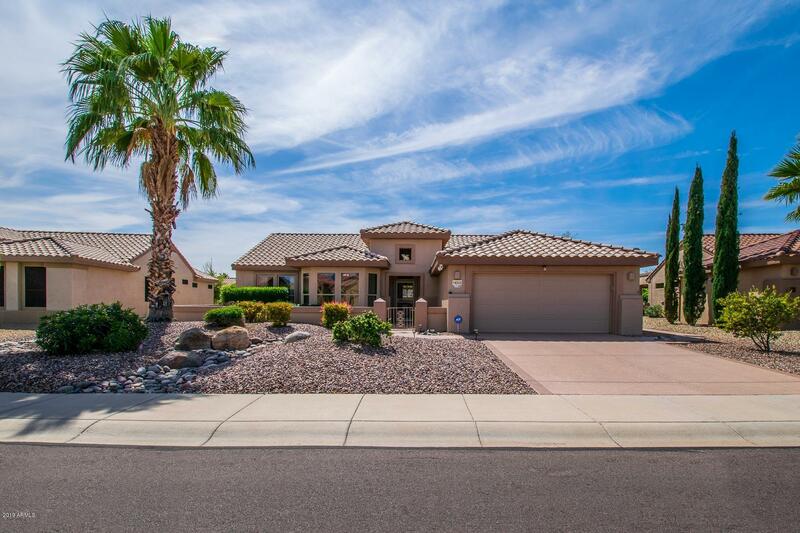 "Stunning home on Desert Springs Golf Course 16th hole- with Mountain Views! 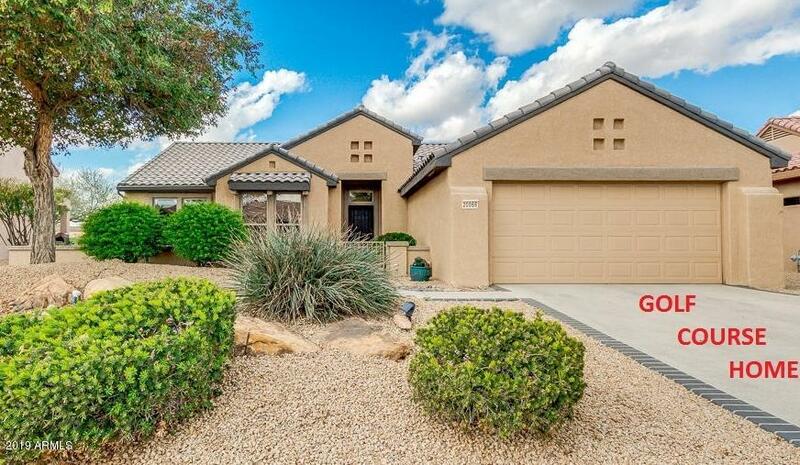 Extended Palo Verde model has 3 nice bdrms & 2 full baths. Upgrades! NEW SS appliances, Wood-like floors, High-end counter w/ rimless sink, custom painted cabinets w/ sliding drawers, Granite in baths. Breakfast nook w/door to garden courtyard - perfect for morning sun & coffee. Built in desk by nook. Huge Master Bdrm w/ bay window- bath w/ double vanity sinks, separate toilet & walk-in closet. Split floor plan. 2nd b"
"Golf course extended Palo Verde. Located on Desert Springs #17. Split floor plan, 1909 square feet, 2 bedrooms, 2 bathrooms, extended enclosed den, great room concept. 2 full bathrooms. 2 sinks in master bathroom. Bay windows in kitchen and master bedroom. Skylights. Door to courtyard from kitchen. Open light kitchen with breakfast bar. Extended patio offers optimal outdoor space for entertaining or just enjoying the view. Flagstone sidewalk. Front security door. Garage has ramp for golf ca"
"Absolutely stunning 2 bed+Den home in the exclusive Sun City Grand active adult community. Tons of upgrades, including wood laminate floors in all living areas, plantation shutters, crown molding, upgraded baseboards, two tone paint & so much more! Updated A/C! Open concept living area! Huge eat-in kitchen offers plenty of maple cabinets w/ crown molding, corian counters, custom backsplash, pantry & matching dark stainless appliances. Spacious master suite provides lots of natural light & en sui"
"COME SEE THIS VERY SHARP, UPDATED, EXPANDED PALO VERDE***N/S EXPOSURE***LARGE COVERED REAR PATIO THAT FACES SOUTH***GAS BIB FOR BBQ GRILL***FRONT COURTYARD***TWO-CAR EXTENDED LENGTH GARAGE***THREE BEDROOMS***BAY WINDOW IN KITCHEN and MASTER BEDROOM***SS APPLIANCES***QUARTZ COUNTERTOPS IN KITCHEN***MODIFIED ENTERTAINMENT CENTER FOR LARGER SCREEN TV***3RD BEDROOM EXPANDED 4 FEET***UPDATED BATHROOMS***CUSTOM COLORS THROUGHOUT THE INTERIOR***MOTION SENSOR LIGHTS FRONT AND BACK***ENERGY SAVING ATTIC "